Tessa and Cary wearing antique Afghanistani caftans in the garden room, a patterned passage really, where Cassian sleeps. A Kelim rug covers the bed, the cushions are sewn from Indian silk scarves. Caftans from Oxus, 490 Kings Road. Tessa Kennedy lives down amongst trees and flowers on the Bayswater edge of Hyde Park; on a broiling blue July day it seemed more like the South of France with mimosa yellow awnings over the windows, white iron table and chairs set up on the terrace. On the corner of a great white classical block of houses, it’s a garden flat — no agent’s euphemism — knocked together from two; in the centre are a pair of tiny courtyards Tessa is changing into conservatories so that flowers can flower all year round: her sons can also wheel their bicycles straight out of doors to play. They are Cassian, Damian and Cary Elwes., 11, 10 and 7, and there’s Dylan, the baby, 7 months old. Inside, a dramatic maze of rooms opens off the central chocolate-varnished corridor; everywhere carpets, tapestries, tartan and Indian silks make endless patterns. The old wine cellars have turned into great scarlet felt lined storage cupboards like the ones she designed for the Donald Davies shop, no dust can creep in. The drawing-room converts to a cinema built when Stanley Donen lived there; Tessa has hardly changed this at all. The projection room has mighty machines like the Marble Arch Odeon, she has registered herself as Kennedy Previews and has a projectionist hired full time—to show films to friends after dinner once or twice a week, or a couple of James Bond epics for the boys: “They love it of course and get absolutely boss-eyed.” Her fascination with gadgetry extends to video tapes, high-powered headphones for the stereo, intercom and a splendid American push-button dial telephone you can ring in on but not out. With the push-button stuff are clumps of fresh flowers, dog roses, daisies, piles of cushions in antique fabrics or in the flame stitch tapestry she sews on plane journeys, her collection of walnut shell sewing boxes, photograph, paintings—including a quartet of Louis XIV’s wife and mistresses—and carpet in a different colour but the same pattern as the one she designed for Burke’s restaurant. Burke’s is one of her decorating jobs she likes the best—along with Sir George and Lady Weidenfeld’s house and the flat she made for John Barry in an office block overlooking the Thames: “We installed such powerful sound that it moves right across the river and people coming out of the Tate look quite dazed.” Now she is working on a couple of country houses, one is for John Aspinall, and offices for Polydor records, and several new ideas, like a sauna in a storage cupboard, to build into this family and garden flat. 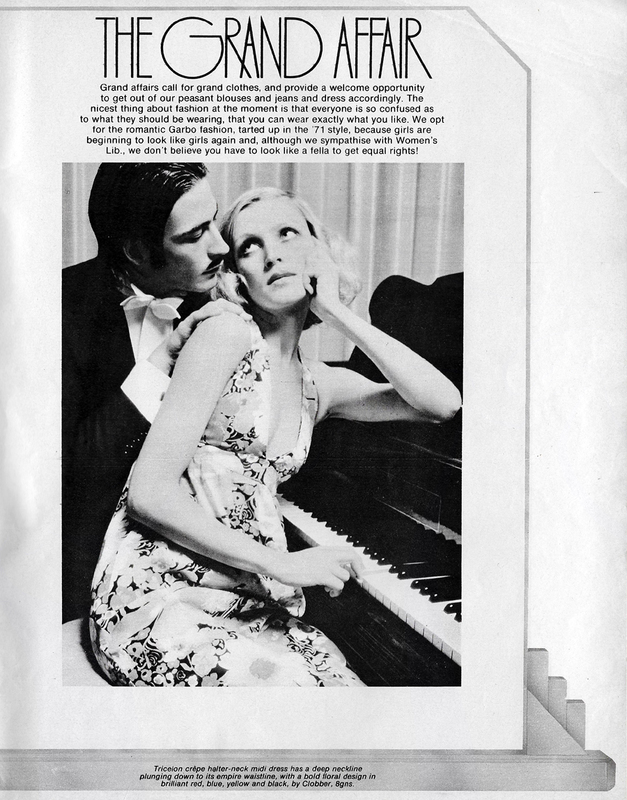 Scanned from Vogue, September 1970. Patterns of carpet, tartan and voile in the drawing room cinema. The carpet is similar to the one Tessa designed for Burke’s; her voile dress with bib of rare oriental fabric comes from Thea Porter, £68. Tessa in the hall, a varnished chocolate box hung with brown and white cottons. 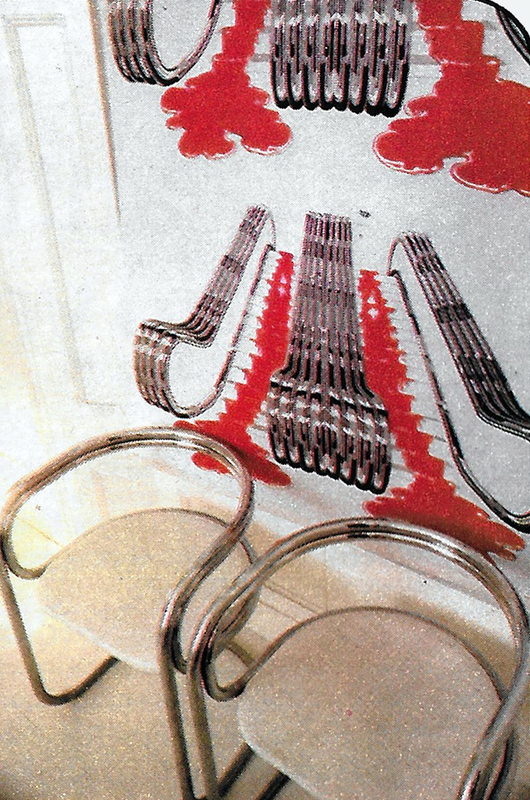 The gothic chairs are part of her collection. Her long scarlet chiffon robe, £35, from Thea Porter. Scanned by Miss Peelpants from Cosmopolitan, March 1975. Sarah Drummond talks to six talented people about their highly original hang-ups. JANNIE GOSS is an Australian model, who has lived for the last eight years in London with her architect husband, Ian, their eleven year old daughter. Mini, and a cat. Their flat in Camden Town is big and airy, with white walls. high ceilings and potted geraniums twelve feet tall. Jannie hangs her jewellery on the walls: the effect is bold and beautiful. It’s also highly practical. “The great thing about pinning up jewellery is that I can find it so easily—it’s not just for show: of course I wear the stuff, too. I used to keep my necklaces around a mirror, hopeless because everything became knotted. and you couldn’t get at it in a hurry …I like organised clutter—great areas of space, then areas of things; it makes dusting easier, too. And Ian and I are both keen on a functional as well as decorative environment. I move my jewellery about, to change the shapes and patterns they make, which is fun. I just use ordinary pins. the very long dressmaking ones—anything heavier, like a nail, would mark the walls. I’m a collector by nature, I was buying up Art Deco jewellery before it became fashionable, when it only cost a few bob. I’ve never bought from the antique market, but sometimes at Portobello Road and Oxfam shops; mostly I just nose about in junk shops and jumble sales. People say I’m clever at finding things but for every four looks, only once will You find a piece you really like and want to buy. GRAHAM WATSON makes bead curtains that swish exotic-ally as you pass through, like a ‘Twenties shimmy dress, beaded strands trailing in your hair and on your shoulders. His beads can depict your portrait. a fantasy landscape, cinema curtains, an old poster—whatever you want. The curtains are hung in doorways. on walls, around baths. Graham’s clients in-clude Chris Squire of the rock group Yes, photographer David Bailey, and film director Joe Losey. “I started off bead-work when I was at drama school . . . act-ing’s an overcrowded profession, and I found it demoralising,” Graham explains. “I saw a play on television one night, and in the background there was a beaded curtain that looked as though it had some-thing painted on it, I couldn’t quite see. But it intrigued me.” . . . To the extent that the very next day Graham started threading beads him-self. But beads are hard to find in England. and Graham traced the best bead sources to Germany (for wood) and Czechoslovakia (for glass). He declared himself a registered company, and went to work three years ago. “I still import the beads, but we dye most of the colours our-selves, otherwise you’re landed with all the shades you don’t want. I often mix glass and wooden beads, because glass alone is too heavy.” Currently, Graham is working on a huge black and silver portrait of Buster Keaton, and he’s planning a three-dimensional number. If you want a curtain made, and they cost around £120 (door size), you can reach Graham Watson at 13c Cunningham Place. London NW8 (01-286 0891). PIP RAU is hooked on folk tradition, on the embroideries, colours, prints and patterns of Central Asia and the Middle East. Home is like a bazaar, her shop like a souk where she sells dresses, waist-coats, robes, great pieces of faded cloth, incredibly bright embroideries. Her walls are jam-packed with treasures. and Pip’s body is covered with clothes of tribal designs, too. “I’d never put up pictures.” she says, “hangings do so much more for a room. They’re vibrant and vast and warm. Infinitely cheaper, too. I’ve been collecting ever since I can remember. I love markets. I lived in Israel for ten years. I was married to an Israeli. and travelled all over the Middle East. and now we’re separated I’ve come back to live in London.” So it seemed a natural move to open a shop (Rau Gallery, 36 Islington Green, London N1, 01-359 5337) selling all the things she loves, and it means she can justify her passion for travel. “I plan to go away three or four times a year to find stock,” she says. “My last trip took six weeks; I drove all through Eastern Europe, buying in Romania and Yugoslavia, and on to Turkey and Iran. and then Afghanistan. There are always difficulties at frontiers—you need all the invoices and endless bits of paper. Prices are going up and up. sources are drying up, too, as increasing numbers of people get interested. My customers are very mixed—specialist collectors, or people who fall in love with something. I don’t think clothes like these should ever be altered. Just buy what fits.” Pip hangs dresses and the lighter hangings with drawing pins, and uses tacks for anything heavier. Dresses can cost as much as £50 —an antique, hand-woven heavily embroidered Palestinian wedding dress, for example—and wallhangings vary enormously from small Persian cottons at £4 to kelims and Bokharas (large-scale embroideries on silk) at £230, or kelims for £400. Scanned by Miss Peelpants from Over 21 magazine, April 1975. How many of you have bothered to do anything to your rooms since you moved into them months and months ago? Are you still living in a shamefully untidy bed-sitter, and do you still get that ‘How I wish I had a cheerful, bright room’ feeling every time you come home from work? Have you, for weeks now, been meaning to get down on hands and knees to scrub and scrape? Has your boy-friend repeatedly offered to help wall-paper the ceiling and bang the nails in? We asked Barbara Hulanicki of Biba to design a fairly inexpensive bed-sitter for 19, incorporating a few original ideas that were not unduly complicated to carry out. She chose Pontings, which has a good whitewood department—the result is rather stunning. You can see the 19 Biba and Pontings’ bed-sitter on display, from 19th September, in the window of Pontings, next door to the High Street Kensington tube station. All merchandise can be got from Biba. (opposite Pontings at 124 High Street Kensington, London, W.8) or Pontings. Plump and luxuriously cosy, quilted cushions, with “Thirties” motifs. 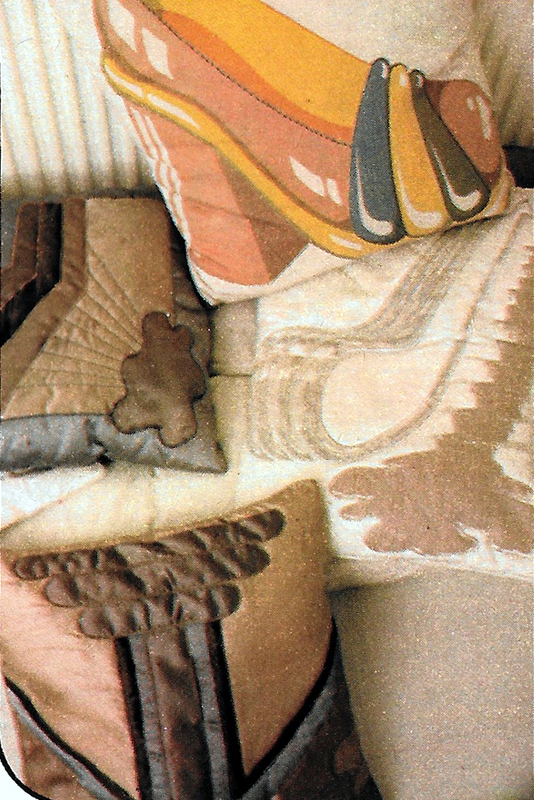 Incredible feature on legendary pop artist and architect Jon Wealleans and his textile designer wife Jane Hill who were heavily involved with the Mr Freedom shops and products. 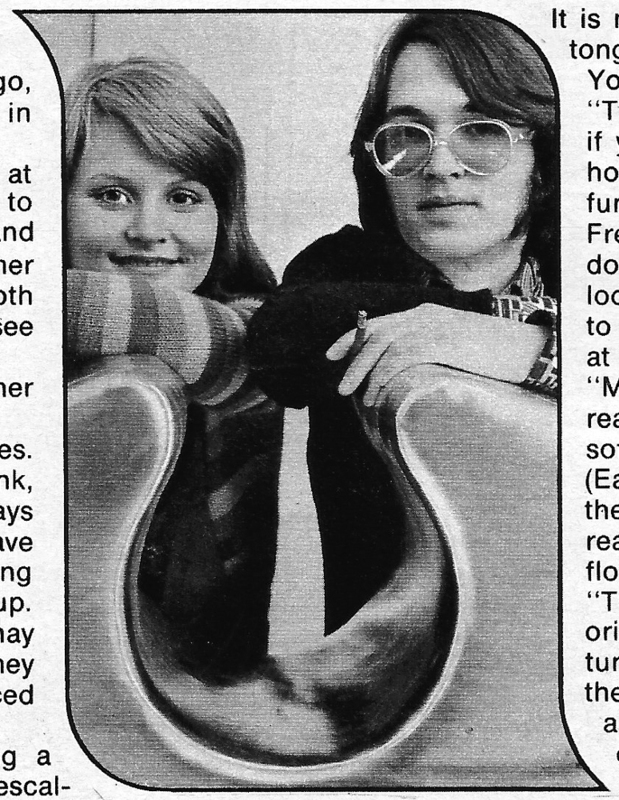 Scanned by Miss Peelpants from 19 Magazine, March 1971. Jon Weallans and Jane Hill are two ex-Royal College of Art students, both twenty-four. They were married in San Francisco six months ago, and they live and work in an Edwardian house in London’s Notting Hill Gate. Both designers, Jane studied textile design at college, and Jon studied interior design; so, to put it simply, Jon designs the furniture, and Jane covers it. They don’t often work together but, whether working alone or together, both produce pretty off-beat stuff, as you can see from the photographs of their living-room. Jane, who made the escalator blind, says her ideas come from magazines. An unusual escalator roller blind, which has been silk-screen printed in red and black, on cotton. “We’re both designers, and that’s all we’re good at,” confeses Jon. “We have no other perks, this is how we make our bread. The people I respect most are the people who have come to terms with the fact that they are making a living, and that they are not arty dilettantes. They are the people who are really on the ball, and who can get up and do a bit of graphic design on their knee, whilst eating beans on toast, or whilst watching television. 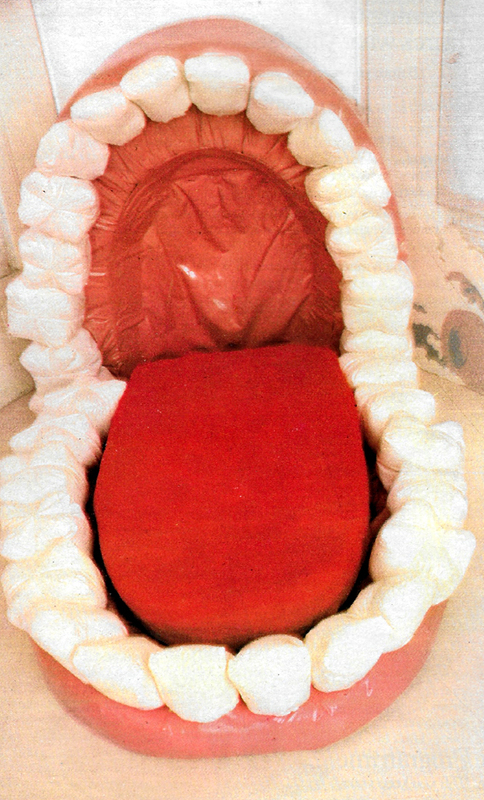 A false teeth sofa, with a soft and life-like tongue for some idle lounging. “The teeth may seem pretty funny,” he says, “but if you go and sit on the Underground in the rush hour and look at those people, they’re pretty funny. I mean, who’s the funniest? Maybe Mr. Freedom are the most honest funny people in Lon-don, because the people who wear their clothes look really happy. And, with my furniture, I’d like to give just a few people a bit of a buzz, by looking at it. I’d like them to think again. “My ideas usually come in a functional way. I really did want a unit that could make up a bed, sofa or a room, which is what the jigsaw seats do.” (Each unit costs £30 from Mr. Freedom.) “It’s the most obvious thing really, because you can rearrange them to any shape. They are in candy-floss coloured, metallic PVC covered foam. 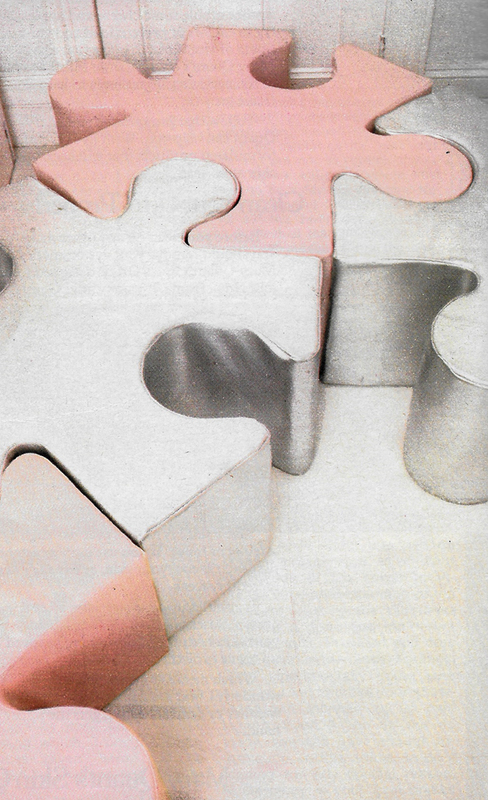 Intriguing foam-filled and interlocking jigsaw seats, can be pieced together or else used separately. “The false teeth are a bit of a con, because they originally started out as a piece of pop, soft sculp-ture, and we only realised when we opened them, that you could make a seat. It is really a case of taking something perfectly normal and everyday, and blowing it up to giant proportions, so that people will look at it twice and think about the ordinary item again. The only furniture he didn’t design in their living-room, are the white plastic stacking chairs by Jo Colombo of Italy, which are sold in this country in Habitat, £11 each. The chrome dining chairs are sold at Habitat shops for £18 each. The floor is covered with white lino tiles, which you can buy in packets, and lay yourself. They are working on their bedroom. A giant Orson Welles film-set bed, placed on fur-covered Busby Berkeley steps, is planned, and the room will be in navy, scarlet and silver. They are painting stars on the, ceiling and having a neon ‘hello’ sign on the wall. Jon’s designs are certainly different, but he’s not entirely devoted to the freaky. As he says, “I did the main branch of the Bank of England in Leeds, and they were the straightest people. You couldn’t get further away from Mr. Freedom if you tried.